Apex Auto Glass original owner, Ralph Murguia, had a vision for establishing an unprecedented level of quality in this industry, that would provide a much needed level of service to the community they loved, as well as a means to employ hard working people who shared the desire for doing the best job possible. 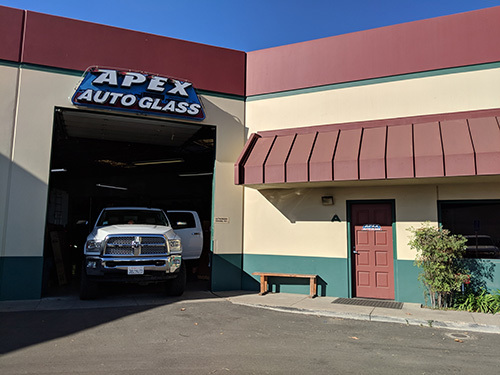 Since its inception in March of 2000, Apex Auto Glass has become synonymous with excellence, both in the high quality of their finished product, and in their exceptional customer care. 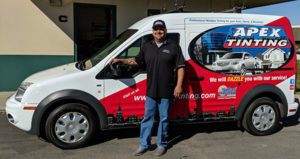 Ralph was born and raised in Santa Maria, graduating from Righetti High School before embarking on a career that provided him with over 30 years of glass work experience. Ralph has been happily married since 1993, to his wonderful wife Laura who help in the Apex office. One of their 3 sons, Anthony, also works for Apex. Ralph is proud to run a family oriented business that incorporates his love of cars and his commitment to excellent service. Ryan, also a native to our beautiful Central Coast, was born on Vandenberg Air Force Base, where both of his parents were stationed. Ryan graduated from Santa Maria High School in 1995, and two years later married his lovely wife Maria. They have been blessed with 3 wonderful daughters. Ryan joined Ralph as a co-owner of Apex Glass in 2005 and brought his passion for excellence in window tinting to the business. They added the service for not only auto’s but for homes and businesses as well, providing the best in residential and commercial window tinting to our community. Ryan thrives on finding solutions for the specific needs of every situation. He loves seeing the finished product, and the positive impact window tinting makes for each customer. Ralph and Ryan knew from the start that the quality of service they were after, would begin with having employees who have the skillset to do the job, and share their desire to do it better than the rest. This is achieved with thorough training, on-going support and creating a positive working environment. Apex Auto Glass has more employees than any other auto glass business in the area. Most companies in the industry only use one technician per truck, but Apex believes that having two technicians is better than one. It increases the quality and efficiency of the job, elevates the satisfaction of the customer, and enhances the technician’s work experience. Apex employs 14 people, over half of them have been with the company for more than 10 years. As a company they are focused on always having the newest technology and information to better support their technicians and serve their customers. Leading the way in the current trend toward ADAS – Advanced Driver’s Assistance Systems, Apex uses Opti-Aim, the latest in calibration equipment, making it the only local company currently able to offer one stop recalibration service for those with ADAS cameras on their windshields. Apex was founded on the principle that doing the best possible job would result in the best possible outcome, and that the best outcome is one that benefits many not just a few. This philosophy extends beyond their employees and customers and out into the community that has given them so much. They believe in helping out and giving back in whatever ways they can. They primarily do this by supporting various causes, sponsoring local athletes, our high schools and youth teams. Apex is a member in good standing of the Better Business Bureau (BBB). They are supporters of the Auto Glass Replacement Standard (AGRSS) and the Independent Window Film Association (IWFA). 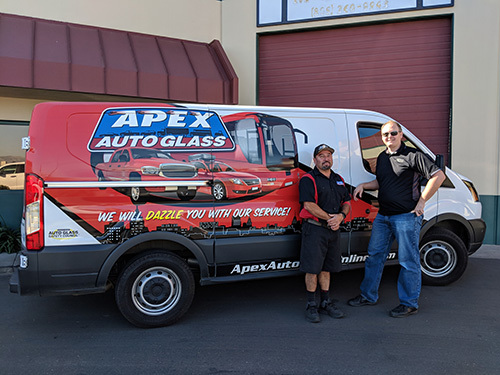 All of their Auto Glass Technicians are certified by the Auto Glass Safety Council (AGSC) and Apex is a licensed contractor for window tinting. But it is really the satisfaction, and consequent loyalty, of their happy customers that provide proof they have achieved what they set out to do; provide quality work, exceptionally well!